Kim is the daughter of Patty Gregory. She was raised in Aniak by her grandmother Anna Gregory. Kim lived in Crooked Creek, Kalskag, and Aniak. She graduated from Aniak Secondary High School in May 2002. She attended UAA and Charter College and studied accounting. Kim is now attending the University of Alaska, Anchorage to earn a bachelor’s degree in finance. She worked for Donlin Gold for eight months as a core handler, core cutter, and laborer. She worked at TKC from December 2007 until November 2009 as a Shareholder Records/Administrative Assis­tant. She works for Kuukpik Corporation as Office Manager. Kim has been a TKC board member since 2013. She currently serves on the Proxy, Shareholder Relations, and Governance Committees. 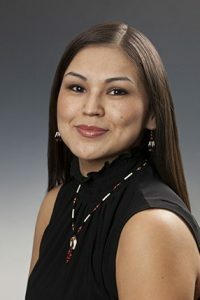 In October 2013, Kimberly was elected to serve on the Kuskokwim Educational Foundation Board.